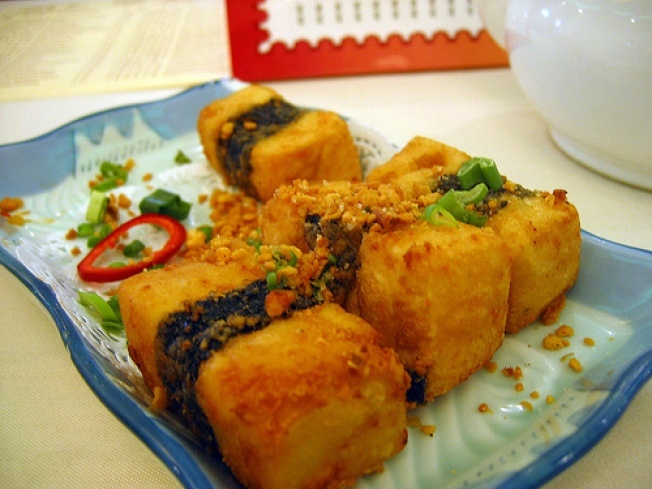 Fried tofu wrapped in nori at Asian Pearl Seafood Restaurant. I never go to Richmond. Well, almost never. When I’m in the East Bay and I find myself craving jackfruit chips or daikon kimchi or razor clams, I go to the Richmond branch of 99 Ranch market, the Asian-American supermarket chain that stocks just about everything East Asian. The market is located in the Pacific East Mall, a perpetually busy shopping center catering to the Bay Area Asian community. All that grocery shopping can make one hungry, and during one of my trips there, I had dim sum with my friend Dominic at the mall’s Asian Pearl Seafood Restaurant. The restaurant was packed, but we managed to get seated quickly, and we started with the fried tofu wrapped in nori, one of my favorite dim sum items. This would have been delicious was it not for the heavy salt overpowering the tofu, seafood and fried garlic bits. I was thirsty after eating this. We tried the shrimp and chive dumplings next, which are another of my favorites. The wrappers were perfectly translucent, but the shrimp taste wasn’t strong enough. The chive flecks provided a nice, onion-y flavor. Our third dim sum was the tofu skin rolls. I love tofu skin; I think it’s a perfect wrapper for so many delicious things. In this case, it was the perfect wrapper for so many average things. I loved the bits of shiitake mushroom in here, but again, the flavor didn’t really stand out. Lastly, we tried their potstickers, which I’ve found can either be a glorious hit or a disappointing miss when it comes to dim sum. In this case, the potstickers were actually in between. The dough was thick, the innards were juicy and the casing was crispy on the bottom, but the flavor was underwhelming. This was my first visit to Asian Pearl Seafood House, so I don’t want to judge it based off of only four dim sum. A major factor that I chalk my experience up to is that there simply weren’t many carts being pushed around to choose dim sum from, as it was nearing the end of dim sum hours. This creates what I like to call Impatient Dim Sum Syndrome, whereupon I tire of waiting for something good to come around and just pick whatever is on the nearest cart. Next time, though, I’ll arrive early, I’ll take my time, and I’ll hope to taste more flavorful dim sum.